Hi everyone! For all intents and purposes, I'm DeVeeM. Kelly invited me to write guest posts for Cooking on Skates, so here I am! A while ago, my favorite website published an article that described something I'd been doing sporadically already: cooking postmortems. In other words, after you finish cooking and eating something, you write notes about what worked and what you think you can improve the next time you prepare it. 1. Turn on the oven first. 2. Always grease the pan. 3. Rotate the cake mid-bake. This is not a commercial oven. 4. You cannot use too much powdered sugar on your surface when you are rolling fondant. 5. You can roll your fondant over the powdered sugar too many times. 6. You always need to add way less water than you think. 7. 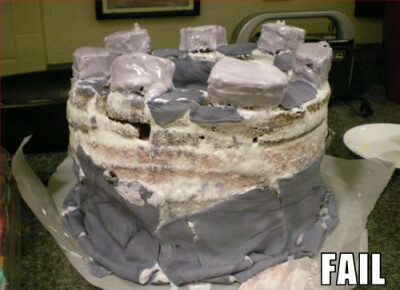 Fondant is heavy and does not stick to light (i.e. non-dense) frostings. Do any of you guys do cooking postmortems (or something similar) as well?